Congratulations to all students from Northern High School and Southern High School who recently competed in the 2019 Allegany College of Maryland/LaVale Lions Club Tri-State Mathematics Scholarship Competition. Southern High School was awarded 4th in the team competition. Individually, Katie Catulle (Southern High) placed 9th overall, and Will Meagher (Southern High) finished 6th overall. Both students won $250 scholarships. 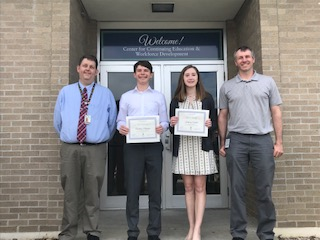 Pictured (left to right): Ryan Wolf, GCPS Math/Science Curriculum Specialist; Will Meagher; Katie Catulle; and Larry Krupa, Southern High School Math Teacher and Department Chair.